Home > Knowledge Center > What Is a Hybrid Plant? A hybrid plant is a plant grown from the seed produced by cross-pollinating two distinct parent plants of different varieties. This process of controlled pollination creates a new, third variety that will hopefully have a combination of the desirable traits of each of the parent plants. 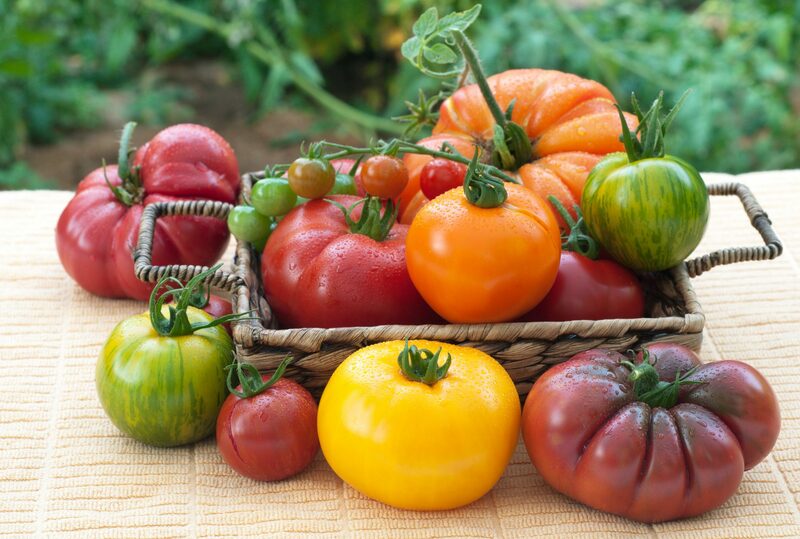 Some widely known examples of hybrid plants are Early Girl, Big Boy and Celebrity tomatoes. How Are Hybrid Plants Made? To create a hybrid plant, a grower first chooses two parent plants that have desirable traits. Then, they cross-pollinate these two varieties through controlled pollination. This means that they prevent open pollination and self-pollination (processes that happen in nature) by protecting their female plant from outside pollination and manually pollinating the female plant with pollen from the male plant. The grower then harvests the seed produced by this controlled pollination and plants it to grow the new variety. The new variety is then assessed to see if it has the desirable traits from each parent that the grower was hoping to combine. For example, the grower may have chosen one parent plant from a variety that is disease resistant but has small fruit and the other parent plant from a variety that has large fruits but is prone to disease. The hope is that the new variety they create will have the positive traits of the parent plants. In this case, that would be a plant that is disease resistant and produces large fruit. If the new variety does not have these traits, then the grower must start over and continue to experiment until they get the desired traits. Once they find the parent combination that produces the desired results, they will continue to do that cross each year to get seeds they can plant or sell. An F1 hybrid is the first generation of a hybrid plant that is the offspring of two distinct parent plants of different varieties. The parent plants are bred through controlled cross-pollination to create a new, third variety of plant. This new variety is an F1 hybrid. Are Hybrid Plants the Same as Genetically Modified Plants? Some genetically modified plants even contain genes from completely different kingdoms. For example, scientists may splice in genetic material from bacteria in order to create a plant more resistant to a particular disease or pest. With little longitudinal information on how genetically modified plants behave over time, there is a lot of controversy over whether or not genetically modified plants are safe. This is not a concern with hybrid plants, where growers simply manage the natural reproduction process to create desirable traits. Hybrid plants are propagated through controlled pollination in which the grower selects parent plants with specific traits and purposefully breeds those parent plants to create a hybrid plant. It is essentially the same, natural process of reproduction that occurs in open pollination, except the grower controls the reproduction process by selecting the parent plants and preventing open pollination – instead of allowing nature to take its course. Open pollination is what occurs naturally in your backyard garden or commercial fields or in the wild. This process occurs when pollinators – bats, bees, butterflies, birds, wind – complete the pollination process. Open pollination generally increases biodiversity, but the resulting plants may have traits that vary significantly; whereas, the controlled pollination of hybrid plants results in specific, expected traits. Heirloom plants, which are also called heritage plants or standards, are open-pollinated or self-pollinated and are grown from seeds passed down in families or communities over the generations. Most gardeners and growers assert that an open-pollinated variety must be at least 50 years old to be considered an heirloom. Others define heirlooms by the ability to trace the provenance of the seeds back through the generations. We have all walked through a farmers market or the produce section at our local grocery store and seen one bin of tomatoes that are nearly identical in size, shape and color next to another bin filled with tomatoes that are small, large, round, lumpy, orange, red, multicolored, and completely unique. The first bin with the nearly identical tomatoes will be from hybrid seeds that provide that uniformity of color, size and shape. The second bin of tomatoes that completely lack uniformity are heirloom varieties grown from open-pollinated seeds. Whether you should choose hybrid seeds and plants, or open-pollinated and heirloom seeds and plants depends on your preferences and goals. Many gardeners plant both heirlooms and hybrid plants in their gardens. Both types of seeds have advantages and disadvantages, so we will address those here to help you decide which type is best for you. Hybrids have more uniform characteristics when compared to open-pollinated plants. Hybrids can be bred to have specific, desirable traits, such as larger harvests, disease resistance or a longer blooming period. Disease-resistant hybrids may mean fewer chemicals are needed to ensure survival. Hybrid seeds allow commercial growers to produce uniform plants, flowers, fruits, or vegetables, which makes them more attractive to consumers. Home gardeners often prefer hybrid seeds for uniformity in their flowerbeds. Hybrid plants often grow faster and are more vigorous (known as “hybrid vigor”). Hybrid plants are often bred to thrive in less-than-ideal conditions, such as drought conditions. Growing hybrid plants limits biodiversity and contributes to a continued loss of variety. New hybrid seeds must be produced or purchased every year. Unlike heirloom and other open-pollinated plants, seeds from hybrids cannot be saved to plant in your garden from one year to the next or to be passed down to your children. The seeds of hybrid plants do not breed true and produce unpredictable traits (if they grow at all). For example, the offspring may have just the traits of one grandparent or may have completely unexpected traits. Hybrid seeds are more expensive to produce and more expensive for growers to purchase. The yield from the offspring of hybrid plants is significantly reduced, which is another reason you must purchase new hybrid seeds each year. Many gardeners believe that fruits and vegetables from hybrids lack the flavor found in heirloom varieties. Should I Buy Hybrid or Heirloom Plants and Seeds? The answer to this depends on your preference and goals. If your goal is to fill your flowerbed with uniform plants that you can predict will be similar in size and bloom color, hybrids are the way to go. If you rely on your vegetable garden to produce a bountiful harvest to preserve for winter, hybrids may, again, be the answer. You should also choose hybrids if you prefer fruits and vegetables with a uniform appearance that resembles what you would purchase at your local grocer. If you want to save money by saving seeds from your garden to plant the following year, go with heirloom varieties. You should also choose heirloom seeds and plants if you want to support biodiversity or if you prefer more flavorful produce.